So much history in one pedal! The Pro Co RAT is a legendary pedal effect, originally built in the 1970s when Scott Burnham decided he can produce a better distortion than the many famous units he repaired along the years. The Rat became so famous that other distortion pedals were measured against it, you can literally hear the Rat on some of the most influential recordings from the last three decades. 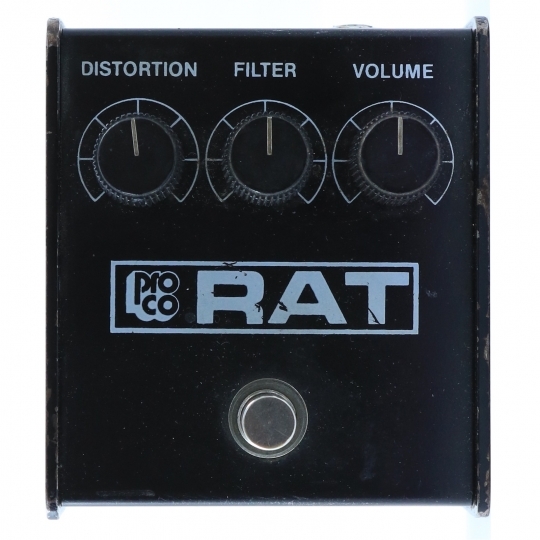 The list of famous guitarists is simply too long in order to list them here... but here are a few names that should be familiar to you: Curt Cobain, David Gilmore, James Hetfield, Andy Summers, Joe Walsh and so on...The version we demoed here is an original 1987 Blackface ProCo RAT. It uses the LM308 chip and has no on/off led.